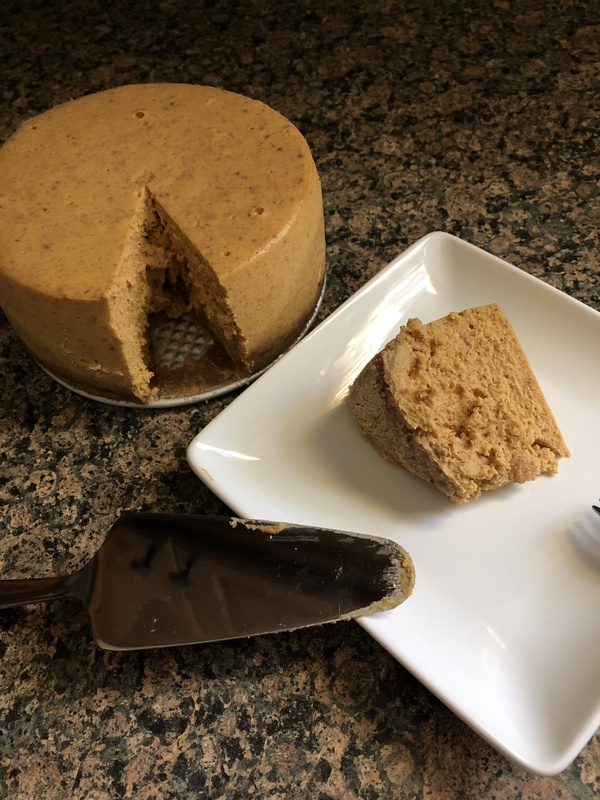 I am sneaking in one more pumpkin recipe this season before the Holidays take over… A Slow Cooker Pumpkin Cheesecake. This is actually the third cheesecake I’ve made in my slow cooker. Earlier this year I shared with you a Chocolate Chip Cheesecake and a Sour Cream Cheesecake. Out of the three, this one is my favorite. What can I say… I am a fan of Pumpkin. I actually adapted this recipe for a slow cooker as the original one called for it to be made in a pressure cooker. While I do own one, only because it was my parents, I am a bit fearful of using it. I remember my mom always using it to make beans. She preferred using dry beans over can ones to make habichuelas guisada (stewed beans) so she would use the pressure cooker to soften them up before making them in the stew… YUM! Maybe one day I will work up the courage to using it, but, for now, it is perfectly situated on the back of a shelf in my cabinet. I began by making the crust. In my food processor I pulsed graham crackers into crumbs. I transferred the crumbs to a medium bowl and added in melted butter, cinnamon and sugar and mixed it together until it was well combined. I then pressed the crumbs into the bottom and slightly up the sides of a 6-inch springform pan that I sprayed with cooking spray. Next, I made the filling. I beat cream cheese and butter together until smooth and then added in pumpkin, pumpkin pie spice, flour, and whipping cream and continued beating until it was well blended. Finally, I added in the eggs and vanilla extract and beat it until just combined. I then poured this into the prepared crust. I placed a rack in the insert of my slow cooker and then filled it with a 1/2-inch of water (about 2 cups for my 6qt. slow cooker) and then placed the pan on top of the rack. I covered it and cooked it on high for 2 hours. The center should still be a bit wobbly and the rest of the cheesecake set. You don’t want to overbake it. After the 2 hours, I turned off my slow cooker and left it covered so the cheesecake could cool. After the hour, I removed the pan and transferred it to a wire rack so it could cool completely. After refrigerating it overnight, the following day I enjoyed a slice! Spray a 6-inch springform pan with cooking spray. Place a rack inside the insert of your slow cooker and fill with a 1/2 inch of water (about 2 cups for a 6qt. slow cooker). In a medium bowl mix the graham crack crumbs, melted butter, cinnamon and sugar. Press the crumbs in the bottom and slightly up the sides of the springform pan. Using an electric mixer, beat the cream cheese and butter until smooth. Add in the pumpkin, pumpkin pie spice, flour and whipping cream and continue beating until well blended. Add the eggs and vanilla and beat until just combined. Pour into the prepared crust. Place the pan onto the rack inside of the slow cooker, cover and cook on high for 2 hours. Turn the slow cooker off and keeping the lid on, let the cheesecake cool in the slow cooker for an hour. After the hour, remove the cheesecake and transfer to a wire rack to cool completely. Refrigerate for at least four before serving.